Bowling Green - Brandon Milam, an openly gay former inmate of the Warren County Regional Jail, says hatred was the motivation for an assault he suffered at the jail in July. Minutes after teaching a group of other inmates how to play the card game hearts, Milam, 26, was sitting on the bottom bunk of his jail cell when another inmate who lost the game shouted gay slurs before assaulting him July 2, Milam said. That inmate, Timothy Michael Schwartz, 41, of Scottsville, is accused of biting off a portion of Milam’s nose, according to court records. A grand jury indicted Schwartz in July on a first-degree assault charge. Schwartz has pleaded not guilty. The Kentucky Equality Federation, a public advocacy organization for victims of discrimination, hate crimes and school bullying, publicly condemned the incident in a news release Wednesday. The organization is calling on prosecutors to pursue the case against Schwartz as a hate crime and has agreed to provide legal assistance to Milam to help him obtain through the legal system the money he will need for multiple reconstructive surgeries to repair his nose, according to Jordan Palmer, the organization’s president. 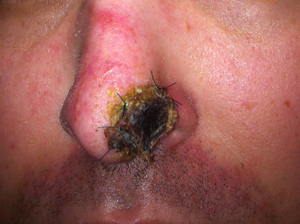 Milam anticipates needing four surgical procedures to repair his nose, with the first estimated to cost $26,000. Jailer Jackie Strode turned over the jail’s investigative information on the incident to FBI Agent Mike Brown. Citing the ongoing investigation, Strode declined to comment. Mary Trotman, chief division counsel for the FBI’s Louisville division, said her agency “cannot confirm or deny the existence of an investigation.” Brown told Milam that the FBI is not pursuing federal prosecution of the case, Milam said. Milam said he has not spoken to Cohron about the case. However, “he will be contacted like all other alleged victims are during the course of the litigation,” Cohron said. Milam said Wednesday that he was in a protective custody cell at the jail when his nose was injured. Strode declined to confirm what type of cell Milam was being held in at the time of the injury. However, it is the jail’s procedure to offer single person or protective custody cells to anyone entering the jail who fears for his or her safety, Strode said. “When people say that their life is in danger, you are going to find out why, and you are going to act accordingly,” Strode said. Milam was serving time for a probation violation before being released to home incarceration July 10, he said. Schwartz, who is still in jail, faces charges in a separate case of theft by unlawful taking of property valued at $10,000 or greater, devising or engaging in a scheme to defraud the Kentucky Medical Assistance Program of $300 or more and five counts of third-degree forgery. In an email exchange between Palmer and Strode, Palmer asked Strode who is going to pay for Milam’s medical bills. Strode responded writing to Palmer, "Brandon Milan (sic) was a State Inmate who was released by the Dept. of Corrections. You may discuss that issue with them." The federation maintains that inmates have a presumption of safety while incarcerated. "The deliberate indifference that the jail facility seemed to maintain when placing Mr. Milam in the cell with the attackers while being aware of his sexual orientation opens them to civil liability," Jillian Hall, vice president of legal at the federation, said in a release. "Having an uncaring attitude towards LGBTI (lesbian, gay, bi-sexual, transgender and intersex) inmates, as well as their fundamental human rights and dignity, appears to be a growing trend across the commonwealth’s county jailers." Palmer said in a prepared statement.